We’d love your help. Let us know what’s wrong with this preview of Legacy of Light by Sarah Raughley. With Maia’s resurrected twin, June, carrying out vicious attacks across the world, everyone believes Maia is a killer. Belle has gon The world is in chaos. To ask other readers questions about Legacy of Light, please sign up. Is this the last book or not? In the first book of the series readers were introduced to high school student Maia Finley who knew that one of her idols must have died because Maia had been chosen to take her place as the new Fire Effigy. 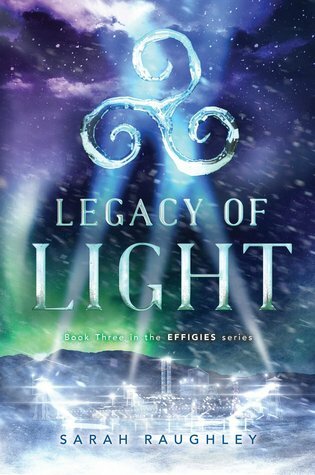 There were al Legacy of Light by Sarah Raughley is the third book in the young adult fantasy Effigies trilogy. Each book of the series builds upon the last with the story picking up shortly after it had left off so this would definitely be a series you would want to begin from the beginning. When the city of New York came under attack from phantoms with the protection system down Maia found herself tossed into the middle of battle without a clue what to do. Luckily Belle, another Effigy showed up and saved the day but it wasn't long until Maia's secret was out and she was pulled into battle with the other girls and the secret government program, the Sect, that is in charge of the Effigies. Now the Effigies are split apart as Saul had brought back Maia's twin, June, to use her to make people believe Maia had been attacking the city. With Belle gone rogue and Chae Rin and Lake disappeared, Maia branded a terrorist and the sect being dismantled the fight against Saul is at an all time high. Legacy of Light is the third and final installment in author Sarah Raughley's The Effigies trilogy. The story picks up shortly after the events of Siege of Shadows. The Effigies are split apart after Saul brought back Maia Finley's twin, June, to use her to make people believe Maia had been attacking the city of Oslo. Belle Rousseau has gone rogue after attempting to kill Maia; Chae Rin and Lake have disappeared. Maia and her group have been branded a terrorist. As for Saul, ultimate plan still remains a mystery. Enfin ce troisième et ultime tome qui conclut une excellente saga ! J'ai passé un beau moment et j'ai bien aimé connaître l'histoire des premières Effigies. The Effigies, four girls chosen to be gifted with powers from each of the four elements, are running out of time in this breathtaking finale of the Effigies trilogy. The Effigies must stop Saul from destroying the world, but they are scattered around the world, and unbeknownst to the others, one of the four is conspiring with Saul. Meanwhile, Blackwell, the leader of the Sect, the army that is supposed to be supporting the Effigies and maintaining order, is pitting Sect members against each other The Effigies, four girls chosen to be gifted with powers from each of the four elements, are running out of time in this breathtaking finale of the Effigies trilogy. The Effigies must stop Saul from destroying the world, but they are scattered around the world, and unbeknownst to the others, one of the four is conspiring with Saul. Meanwhile, Blackwell, the leader of the Sect, the army that is supposed to be supporting the Effigies and maintaining order, is pitting Sect members against each other and framing them and the Effigies for crimes they didn't commit, so he can set himself up as dictator. Maia must confront the dark secrets of past Effigies to find the answer that could change everything and finally put an end to the deadly phantoms. I loved the first two books and was really looking forward to the last installment, but when I finally read it, I have to admit I was a little disappointed. For me, the best part about the first two books was the sisterly bond between the Effigies and the sweet romance between Maia and Rhys. I especially loved the mentorship and playful banter. The girls were apart for most of the last book so it was missing the dialogue from the earlier books that made me laugh out loud and wish I was a member of the group. And, except for the last five pages, there were very few scenes with Maia and Rhys, which I had been looking forward to the most. Much of the last book was fighting and action but it was a little too predictable for me. In fights, none of the "good guys" got hurt, and the "bad guys" always lost. There were a lot of battle scenes, but the Effigies only used their powers a few times. I found myself skipping pages, which I rarely do. The best part of the book was seeing the lives of past Effigies. I also liked how the villain seemed more human as they revealed their complex past and motivations. By the end of the book, the line between the villains and the protagonists was almost blurred. Took me a while to get into this, mostly because there were too many references to characters and events I'd already forgotten. But also a lot of it felt like the third movie in The Hobbit trilogy -- battle after battle after endless battle that dragged after a while. That being said, I really like what we learn about the origin of the Effigies, and what needs to be done to stop Saul and the Sect. I loved the last few chapters, where this all unfolds, and thought the ending was strong. I wish th Took me a while to get into this, mostly because there were too many references to characters and events I'd already forgotten. But also a lot of it felt like the third movie in The Hobbit trilogy -- battle after battle after endless battle that dragged after a while. I wish this book had been shorter / tighter, as some of the twists felt unnecessary and some of the battles endless (and not in a good way). I also highly recommend re-reading the first two books before reading this one, so you'll remember who so and so character is and why they matter. Maia continues to be our only narrator, ARC provided by Simon and Schuster Children’s Publishing via NetGalley for an honest review. I will say this: I didn't foresee many of the things that happened in this book. Many of the events that happened in this book took off in a completely different direction than I anticipated. Specifically, the fact that deities were suddenly introduced, and that it became a race to get the three stones representing each of the three goddesses to make a wish. Maybe I didn't read the previous books carefully enough, but I don't think they alluded this happening? Regardless, I still enjoyed the comra I will say this: I didn't foresee many of the things that happened in this book. Regardless, I still enjoyed the comradeship between the majority of the Effigies. Save for Belle, who also took a completely different turn than I anticipated. I also liked the fact that there was still a "good" section of the Sect, working in the interest of the people. June's appearance put a nice twist to the plot. She certainly threw a wrench in everyone's plans, especially Maia. However, the dynamic between the two could have been fleshed out a little more; I would have liked to see Maia truly grasp what June was thinking, rather than just insisting June was someone to save above all measures. I am so upset and relieved at the same time =) I first read book 1 : Fate of Flames when it came out : "Sailor moon meet Pacific Rim met Avenger" with a headline like this I couldn't pass it right ? I loved book 1, I was confused with book 2, and book 3 was so damn long and complicated to get into, at least for me. I really loved the first two books in this serious and couldn't wait to read this one. I was a little disappointed because this wasn't as good as the previous books. I don't know what it was but something just felt off with this one. The first two I couldn't put down while there were parts in this one that I struggled to get through. I'm glad everything was concluded. Je tiens tout d’abord à remercier Lumen pour l’envoi de ce roman. J’avais beaucoup aimé les précédents et j’avais hâte de découvrir la conclusion de cette saga ! C’est avec une grande joie que j’ai retrouvé Maia dans ses aventures et on peut dire que cette suite est plutôt mouvementée et longue ! Il faut dire que le scénario est extrêmement riche et l’histoire plutôt complexe. On a l’impression que l’autrice a voulu un peu trop en faire et prendre son temps pour conclure mais du coup il a y a qu Je tiens tout d’abord à remercier Lumen pour l’envoi de ce roman. J’avais beaucoup aimé les précédents et j’avais hâte de découvrir la conclusion de cette saga ! C’est avec une grande joie que j’ai retrouvé Maia dans ses aventures et on peut dire que cette suite est plutôt mouvementée et longue ! Il faut dire que le scénario est extrêmement riche et l’histoire plutôt complexe. On a l’impression que l’autrice a voulu un peu trop en faire et prendre son temps pour conclure mais du coup il a y a quelques problèmes de rythme ce qui fait peiner le lecteur par moment. Après, que cela ne tienne, l’histoire est quand même prenante et on a tellement envie de lire la fin que l’on poursuit notre lecture avec plaisir. Well, I read it like three weeks ago and can't remember a thing that happens. I'll chalk it up to the fact that I'm constantly reading but you kNoW this means it was bland. Like flat soda. Good but not great. Wow, this was such a great book, and a great end to the trilogy! We learned so much, and yeah, really enjoyed how it wrapped up! Great ending to a great trilogy!! The 3rd book definitely the best book in the series. Well written with lots of twists and turns to keep you guessing. Not bad necessarily, just forgettable. Not exactly my cup of tea. Loved how everything came together in the end! Its a thrilling race to the end in Sarah Raughley's final book of her Effigies trilogy. The girls no longer know who they can trust with the sect divided in two, and Saul's army is on the rise. They must figure out who they can depend on to fight back as the only hope to save humanity. Its time to scry, to go back to the beginning in hopes of figuring out how to bring an end to the phantoms. Will they find the answers in time? Or will their past come back to haunt them? Highly recommended! I didnt really connect with the main character. Maia had good morals, but I would have liked to see her take charge more often. Her role in the story almost felt secondary. The other girls in the group were the ones doing most of the fighting. The group dynamic wasnt as strong as it could have been. I wanted them to feel more like a team. I loved Lake and her supportive relationship with Maia. Chae Rin was a little rough around the edges with her rude comments, but I still liked her. Unlike Bell I didnt really connect with the main character. Maia had good morals, but I would have liked to see her take charge more often. Her role in the story almost felt secondary. The other girls in the group were the ones doing most of the fighting. The group dynamic wasnt as strong as it could have been. I wanted them to feel more like a team. I loved Lake and her supportive relationship with Maia. Chae Rin was a little rough around the edges with her rude comments, but I still liked her. Unlike Belle with her selfish attitude and complete disregard for the other girls. I felt like Saul and Blackwell made a pretty good antagonists. Getting to see their backstory really helped me understand where his motivations were coming from. I liked getting to know how the effigies and phantoms came to be. Theres also some entertaining messy family drama that comes into play. Some things in the story didnt add up. For one Maia was still being attacked by phantoms while in possession of the protection stone necklace. Despite a couple of other minor things not adding up, I did enjoy the plot with all the secrets, blackmail and conspiracies. I absolutely loved the world and the overall concept of having a group of girls with elemental magic fighting these huge shadow monsters. The girls powers and the phantoms were pretty awesome. I also liked the mix of fantasy and scifi elements. The writing on the other hand didnt flow as well as it could have. It made it harder to get into the story and even harder to stay immersed despite the awesome action going on. I would have liked more tension leading up to to those battle scenes. They just didnt feel as high stakes as they should have been so it ended up dragging. That pacing needed a bit of work. I understand that these girls are bound to be flawed after the way they have been beaten down by society, but I think the whole girl power message could have been stronger had some of the girls relationship not been as strained. I did appreciate it not having any romance and focusing more on the girls personal journey. I liked how the ending showed how far they've all come since first meeting each other. I also appreciated the ethnic diversity among the girls. With the Sailor Moon meets Pacific Rim vibes this could have been so much more than it was. Sarah Raughley grew up in Southern Ontario writing stories about freakish little girls with powers because she secretly wanted to be one. She is a huge fangirl of anything from manga to SF/F TV to Japanese Role Playing Games, but she will swear up and down that she was inspired by ~Jane Austin~ at book signings. On top of being a YA Writer, she is currently completing a PhD in English, because the Sarah Raughley grew up in Southern Ontario writing stories about freakish little girls with powers because she secretly wanted to be one. She is a huge fangirl of anything from manga to SF/F TV to Japanese Role Playing Games, but she will swear up and down that she was inspired by ~Jane Austin~ at book signings. On top of being a YA Writer, she is currently completing a PhD in English, because the sight of blood makes her queasy (which crossed Medical School off the list).